COTA Cafeteria to Be Open! Lunch will be available in the COTA cafeteria. Hours of service will be between 11 am and 3 pm; lunches are approximately $8 - $10. Thanks in advance for giving them your support. Please read this information about the event, as this will help you have a very successful and enjoyable experience at COTA - the premier facility in the US! We are just as excited as you are to get to COTA and enjoy a couple days of awesome track riding at a real MotoGP track. For us to be able to deliver this event and for you to enjoy yourself as much as possible in a safe manner, it is important that you read and understand the following information. Below you will find information which we hope will be useful for your planning of this event. If you still have any questions at all, feel free to email us at ridesmart@ridesmart.info or call Dave directly at 512-469-9491. Any participant not checked-in at registration by 8:00 am on the event date or notified us of a late arrival is subject to forfeiture of their spot with no refund or compensation. If you feel that you are going to be late, email us at cota@ridesmart.info or call 512-689-9875 or call/text 940-393-9895. We will hold your spot until your arrival. No refunds will be given for failure to attend. Ride Smart is a MOTORCYCLE SCHOOL. For Levels 1, 2A, and 2B it is MANDATORY that you attend all classroom sessions. OIL INSPECTION WAIVER You'll be required to sign, in addition to a Liability Waiver, a Mechanical Inspection Waiver, which states inpart: "I have inspected the above motorcycle and take full responsibility for its condition while participating in this event. In particular, I have personally checked that the oil drain plug and the oil filter have been properly tightened and secured. I understand that if my oil drain plug or filter does come loose and spreads oil onto the track I will be put on a one year suspension from riding with Ride Smart. Oil spills can result in extremely serious injuries for the rider and others sharing the track. We ask each of you to take 5 to 20 minutes (depending on the bike) to check and be absolutely certain that your oil drain plug and oil filter are tightened and absolutely secure prior to entering the track." 2. TRACK ENTRY Access to the track will be granted at 6:00 pm on Friday for Saturday's event and 7:00 pm Saturday for Sunday's event (if you arrive early on Saturday, you must park until 7:00 pm when Paddock Entry is allowed). Enter the track at the main entrance (off FM 812 onto "Circuit of the Ameicas Boulevard"), then you'll continue around to the back side into Tunnel 2. Track entry closes at 10:00 pm sharp on both Friday and Saturday night. If you arrive late please check into an area motel or hotel. Camping or sleeping in a vehicle on COTA premises or roadways prior to entry is not allowed. On Saturday and Sunday morning, gates open at 6:00 am. Keep in mind that you need to arrive promptly if staying off the premises in order to have time to register and tech. Check-in will be held in the "Team Building" across from Garage 1. Technical Inspection will be in the Instructor/Staff Garage. Ask in Regsitration for the specific garage number. 3. RIDESMART PADDOCK MARSHAL AND STAFF Staff will be available in the Paddock and Pit area to assist you and direct you in parking and setting up your area. It is imperative that you follow the directions of Staff concerning parking and set-up. If you have a friend arriving after you, please let staff know. If arriving Saturday afternoon or evening for Sunday's event, please check with a Paddock Marshal before parking or setting up your paddock area. In the event of a spill of any type of hazardous fluid (gasoline, oil, etc) or any damage to the facility, immediately notify a Ride Smart staff member or the Paddock Marshal. 4. CAMPING/MOTELS Camping/sleeping at the track is allowed. There is no fee; no hookups are available. No camping or sleeping in any garage, building, or COTA facility. Sleeping or camping in any area or method not allowed will result in expulsion from the facility, loss of trackday privileges, with no refund given. Shower facilities are limited. Ask at Registration for more information. There are motels and hotels close by. Circuit of The Americas has built a relationship with 150+ hotels nearby and can offer some very attractive rates. Hotels near COTA. 5. FOOD ON SATURDAY AND SUNDAY RideSmart WILL NOT SERVE ANY FOOD during this event. Circuit of the Americas does have a cafe which will be able to serve lunch from 11:00 - 3:00 on both Saturday and Sunday, for approximately $8 - $10 per meal. The Cafe/concession stand is located in the Event/Media Building. Outdoor grilling is prohibited. No bar-b-ques or grills allowed. Glass containers are prohibited. No food or soft drinks are allowed in any of the classrooms (water is allowed). 6. EARLY CHECK IN/TECH We plan on having an early Ride Smart check in and tech, on Friday and Saturday night between 7:30 pm and 9:00 pm. All early check in activities will conclude by 9:00 pm sharp. If you plan on checking in early, please be at the track accordingly. NOTE: RIDERS MAY BE REQUIRED TO SHOW DL or OTHER PHOTO ID DURING CHECK IN and ENTRY TO THE TRACK. 7. WAIVER REQUIRED All participants will be required to sign a Waiver of Liability at registration or check-in before any on-track activities. All persons under the age of 18 must sign a Waiver of Liability and have the Waiver also signed by a parent or legal guardian at registration or check-in. All persons under 18 must be accompanied by the parent or legal guardian. Any participant under 16 years of age must immediately contact dave@ridesmart.info for further instructions and pre-execution of the appropriate Waiver of Liability by a parent or legal guardian and the minor participant. No person under 18 years of age will be allowed in "Hot Pit" unless a registered participant with the above waiver executed. 7:30 pm - Early Check-In begins - DL or Photo ID May Be Required to check in. Team Building. 7:00 pm - Track closed. All participants must have left the facility. On Sunday, the track closes at 7:00 pm. All persons should be off the property by then. 9. ELECTRICITY Electricity is only available in Rental Garages (see below). You may use a generator in the paddock. 10. COVERED PADDOCK SPACE/GARAGES Garage spots are available for rental. Each full garage accommodates eight (8) riders or spots. The garages are "open air" once the large doors are opened similar to many covered paddock areas. Garages rent for $75 per day per spot (each garage has 8 spots available at $75 each. Each spot is for an individual rider. No sharing of a spot is allowed) and include electricity, a restroom (restricted to garage occupants) and is open on both sides with garage doors. Beat the sun in the shade, get all your friends together, and have power for fans and warmers. Garages will be open at 6:00 am and locked at 10:00 pm. Your bike and equipment will be secure overnight. No camping, tents, or sleeping is allowed in the garages. Garages are available on a first-come, first-served basis. If you want an entire garage, they are available now for $600. Note: If renting for Saturday only, you must vacate the garage by 6:00 pm Saturday night. If renting Sunday only, your garage may not be available until 7:00 pm Saturday night. There are no provided coverings or shade in the paddock area. You may bring and use canopies or "pop-ups" for shade. Please do not anchor canopies into the asphalt in any way. Use weights or tie-downs on canopy legs for stability and security. 11. PADDOCK SEATING Please bring lawn chairs or camp chairs for seating around your pit area. There are seats available in the Spectator Viewing area (located on the end of the main building on the second floor) during the on-track sessions. 12. SPECTATORS - FRIENDS AND FAMILY We welcome friends and family to come and watch at the COTA event. Non-particpants should park in Parking Lot A and walk through the tunnel to your paddock area. Spectators and riders have access to the Patio Terrace on the second floor of the garage building. No riding of pit-bikes allowed on dirt trails or walkways. All persons (riders and spectators) are restricted to Parking A, paddock area, and 2nd floor patio/terrace. No one is allowed in areas fenced off or gated. Absolutely no climbing of fences. 13. FUEL Fuel is not available at COTA. You will need to bring your own fuel, or be prepared to drive approximately one mile to a local gas station (only accessible via public roads). Bulk containers are not allowed. Maximum 5 gallon jugs. All fuel must be stored outside of the garages and all fueling must be done outside of the garages. No fueling of bikes and/or equipment inside the garages. 14. PETS Pets ARE NOT allowed on the premises. This includes pets restricted to trailers. 15. PARADE LAPS There will be NO parade laps at COTA. We generally will have the following services available at the event, subject to vendor availability. Pirelli tires � you may pre-order by calling (281) 255-6004. Blair Hartsfield with Hart Photography will be photographing the event. Please see Blair's website for more information and pricing. Blair will also be at each morning Rider's Meeting and will setup a monitor with pics from the day. Roger Albert with On Road - Off Road will be providing suspension service. Your bike will be set up specific to you, the rider: your weight, style, and other needs. Setup includesall externally adjustable components, including sag, geometry, compression and rebound damping of the forks and shock to make your motorcycle handle at its' best, all for $40. This is great for track and street riders alike. Pit and Paddock speed limit is 15 mph. Quiet time begins at 9:00 pm Friday and ends at 6:15 am Saturday; 9:00 pm Saturday to 6:15 am Sunday. No motorcycle engines during this time. No revving of engines 6:15 am - 7:00 am. 11:00 pm, lights out. No starting up of vehicles and please finish up your conversations by 11:00 pm. No unlicensed drivers are allowed on wheeled vehicles (this includes bicycles, motorcycles, pit bikes, skateboards, etc. Anything with wheels). No minors, under the age of 18, are allowed in hot areas (including, but not limited to, hot pit and track) unless registered participants. All safety lanes to remain clear and easily accessible. No cords or equipment may be placed on or across fire lanes (marked in red). No wheelies anywhere on the facility: paddock, hot pit lane, the track, etc. No climbing of fences. All vehicles must remain on pavement. Waste oils, fuels, etc must be disposed of in designated containers or removed from the facility. Trash must be placed in designated containers. Consumption of alcoholic beverages is prohibited while the track is open and only allowed after 6:30pm Saturday evening. Glass containers are prohibited. Firearms, fireworks, or weapons of any kind are strictly prohibited at Circuit of The Americas. 18. OFFICIAL T-SHIRTS We are pleased to offer the Official COTA/RideSmart T-Shirt at the event. 19. LAP LOOP AND TRACK INFO Study video footage of laps at COTA: CLICK HERE. Levels 1 and 2 will have a Round Robin session to ensure they know their lines. You will ride Round Robin within the group you registered for. (For those not familiar with a Round Robin, you are led around the track by an instructor, and rotated within your group several times so you can learn the lines). Level 3 will do a minimum two laps on the first session under a yellow flag with no passing. 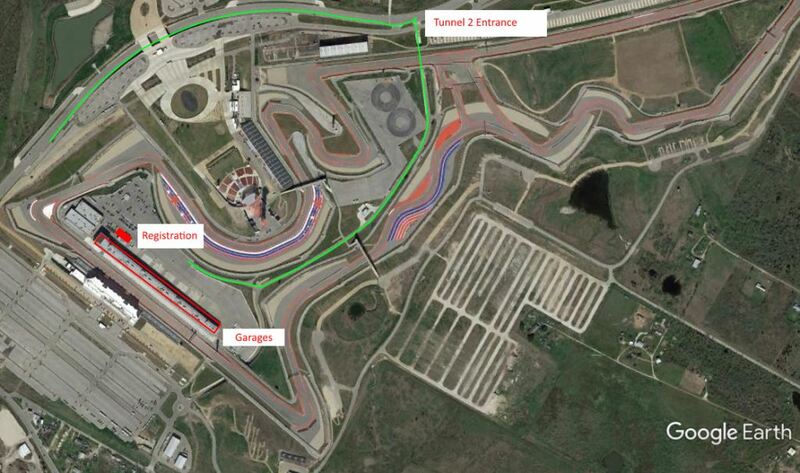 COTA management has advised us that the common areas for run-offs are Turns 10, 11, 12, 19, and 20. Several turns have artificial turf once you leave the track.You should "Roll Through" the turn and not make ANY control corrections until reaching the pavement. Ride Smart will place "X's" using tape on the track surface at turn in as markers to aid you in learning the track line. Damage free BSI, ECE, DOT or SNELL full-face helmet with face shield (flip-up or modular full face helmets are not allowed except in Level 1) BRING YOUR HELMET TO TECH! After-market Helmet quick release systems are prohibited. Helmet cameras are prohibited unless they are incorporated with a 2-way audio system that is securely attached to the helmet using mechanical (clamping system with screws/bolts) means. Adhesive mounts are prohibited. (The only camera system that currently meets this requirement is the Sena unit). Gauntlet style motorcycle gloves with full wrist coverage. Riding Suit - One piece leather suit, Two piece leather suit (Two piece leather suits must zip together for Novice, Intermediate or Advanced groups), or Ballistic nylon suits such as Joe Rocket, AeroStitch etc. (nylon suits only acceptable in the Level 1/Novice Group provided they are either one piece or two piece that zip together with 50% zipper contact, reinforced and padded shoulders, elbows, hips, and knee areas). Tire tread at least 50% of new condition (Discolored tires due to excessive wear will be disallowed. Our on-site tire service will have a selection of tires you may purchase to provide riders an opportunity to pass technical inspection). All glass and reflective surfaces must be taped over fully (Entire surface of light glass or reflective surface must be covered). Brake lights must be disabled (Brake lighting must be disabled by completely covering so that no light is visible, or by removing fuses, or other methods to prevent activation of the light). Any other mechanical issues which may render riding the motorcycle unsafe must be fixed. Spikes, blades (or any other pointed/sharp protrusions) on bodywork, screen, levers, sliders or bar ends, must be removed. On board bike cameras, in addition to adhesive and mechanical mounts, must be tethered from the case to a point on the bike.